I used to work at a TexMex restaurant in college and they had this salad that I loved. It was roasted veggies on top of a bed of lettuce with this tangy, creamy dressing. I’d always order it when I was working a double because everything else on the menu made me want to take a nap. That salad inspired this one. Big tray of veggies ready for roasting! Lots of fragrant herbs and tahini really made this dish special. 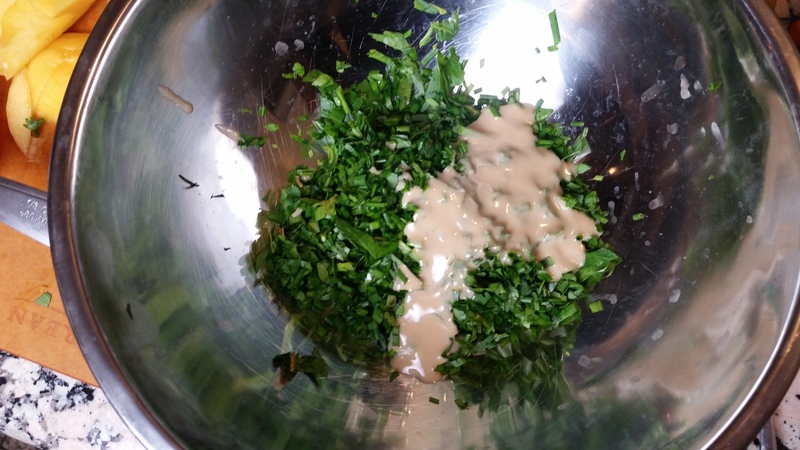 Tahini is great for making creamy salad dressings with no cream. I was really please with the way this came out. That dressing was amazing and I will definitely be experimenting more with using tahini in dressings now that I have a whole jar of it in my fridge. Cut the ends off of the zucchini and cut in half lengthwise then cut the zucchini in 1/2 inch slices on the bias. Toss the broccoli and zucchini in a bowl and pour in 2 Tablespoons of olive oil and toss to coat. Add more if you need to so that the veggies are all coated. Sprinkle with 1/2 teaspoon of salt. Add pepper to taste. 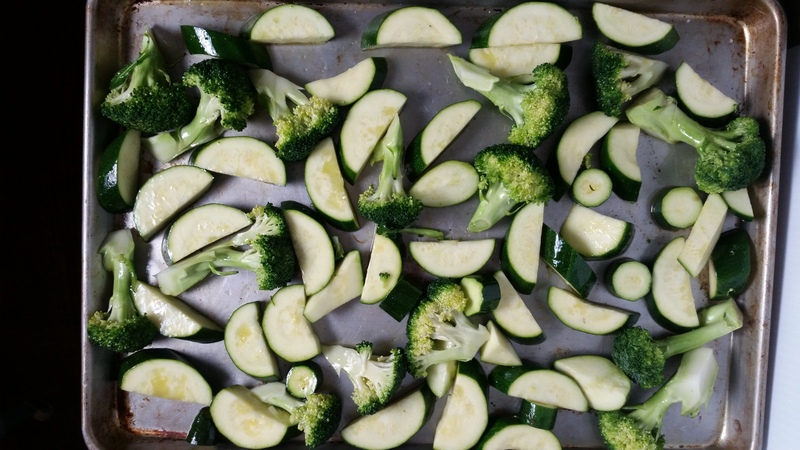 Put veggies in an even layer on a rimmed baking sheet. Roast in the preheated oven for about 30 minutes or until broccoli is charred at the edges. When the broccoli and zucchini are cooked, transfer to the bowl, add the avocado, and toss to combine. Taste and adjust the seasoning again. Roughly chop lettuce and put on plates. Top with the dressed roasted veggies. Enjoy!